1. 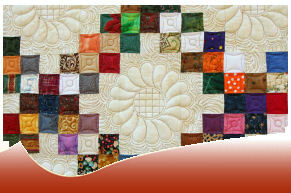 Members may submit their quilt-related items for sale to the public in the Guild Booth. Even though members have a variety of talents, booth items must be sewing or quilting related. Items may be baby quilts, patchwork vests, sewing kits, thimbles, quilt racks, edged towels, or embroidered towels, for example. 2. All quilters who submit items for sale in the guild booth must work at least two hours during the show. If not needed in the guild booth, a quilter may be assigned to another area. 3. The guild will retain 10% of the sale price. The guild will charge sales tax on each item to the buyer, and the guild will pay the combined total sales tax from the amount collected. 4. Each item must include a price label with the member’s name. When an item is sold, the tag must be removed and placed into the cash box; this is how each member’s sales will be tallied. Each member must also submit a list of items for the booth with the price of each item. All baskets or boxes accompanying items must be clearly labeled with the quilter’s name. Click here for the Guild Booth Item List. Click here for the Guild Booth Price Tags. Have any other questions? Check with DeLores Woods.